As a parent, you should be able to rely on your day care facility to provide a safe environment for your child. Unfortunately, many day care providers fail to take necessary precautions for the well-being of children. While government regulations attempt to provide safeguards for children in day care facilities, child safety laws are difficult to enforce and many day care providers are not held accountable for providing substandard care to children. As a result, thousands of children are injured in day care accidents each year. Day care providers have a duty to take precautions to protect children. Electrical outlets should have proper guards, cabinets containing hazardous substances should be locked or properly safeguarded, children should be properly monitored while they are playing outside and playground equipment used by children should be safe and properly maintained. If your child has been injured due to the negligence of a day care provider, Friedman, Rodman & Frank can protect your rights. Our team of skilled Miami premises liability trial lawyers is committed to seeking maximum compensation on behalf of accident victims. To schedule a free consultation with one of our Miami day care injuries attorneys, call 305-448-8585 or contact us toll free at 877-448-8585. You may also contact us online. 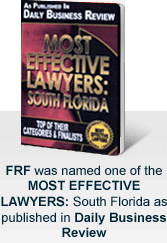 To best serve clients throughout South Florida, we have office locations in Miami, Homestead and Naples.